UBI Research estimates smartphone OLED display shipments reached 95.3 million units in Q2 2017, up 2.6% from last year (92.9 million Q2 2016) while TV panel shipments grew 165% to reach 370,000 units. Compared to last quarter (Q1 2017), smartphone shipments grew 0.6%. 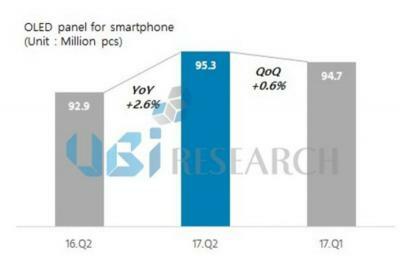 Samsung Display is still the clear market leader - with a market share of 96.7%. OLED TV panel shipments increased 21.2% from Q1 2017, and UBI expects this market to continue growing gradually throughout 2017.